The Hummer XL is a 4-wheel terrain scooter giving it substantially improved stability. The Hummer-XL easily separates into two pieces making it easier to transport when not in use. We like the fact that although this is a large scooter, it can be disassembled easily. It has great standard features and is durable and reliable. I can't say enough good things about the Pursuit XL, it is a highly durable and reliable product. It has a great look and design and has all the bells and whistles you would expect from a Pride scooter. The QPod All Weather Electric Mobility Scooter is the ONLY mobility scooter in the market that has a roof! Yes, you can ride this vehicle in all kinds of weather- rain, sleet, or snow. All-Terrain/Heavy Duty Mobility Scooters can be 3 or 4 wheel scooters. 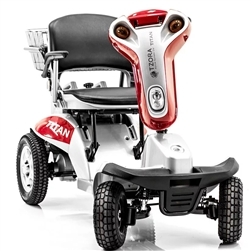 These scooters are heavy duty meaning they have high weight capacities, a sturdy frame, and can withstand a high amount of stress. 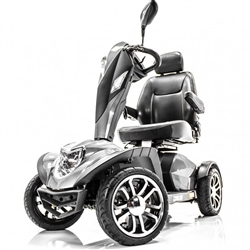 All Terrain scooters are great for use in the home and especially outside on rough terrain.